James Ferrell (Jim) Wood is a graduate of the Foundation for Shamanic Studies' training programs in various Shamanism and Shamanic Healing courses as well as a graduate of Sandra Ingerman's Shamanic Teacher Training. 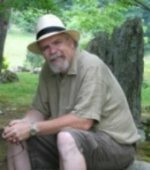 He has studied Celtic Shamanism extensively with Tom Cowan and co-facilitates Shamanic Workshops and Gatherings with Tom. He is a Trained Shamanic Practitioner and Shamanic Counselor and an Ordained Druid. He is also a student and dabbler in Herbalism and Alchemy. Jim has a private Shamanic healing practice consisting of the various aspects of Shamanic Healiing including Soul Retrieval, Extraction, Depossession, Power Animal Retrieval and Psycho-pomp work. Jim also teaches Shamanic Journeying and Soul Retrieval workshops and facilitates several Shamanic Drumming Circles. As an ordained Druid of FoDLA (recognized as an organized church by the IRS), Jim is available to perform marriages as well as hand-fastings, funerals and memorials, rites of passage and other Pagan rituals. Jim is the founder and Druid of the Grove of the Greenwood recently relocated to Saint Augustine, FL where he performs rituals and offers instruction and guidance for those interested in a Druid path.